The behavior and performance of a machine are controlled by the programming languages. The programming languages are extremely significant and vital for the software technologies. This is actually the basic and the main thing and without this programming is not able to do any of the things about the software. This is the basic and the fundamental factor to each software. Programming languages are the core part of any the software. The majority of the softwares as well as the applications is not made without the programming. The key and the significant factor of the embedded systems and the softwares is the programming language. We are not able to communicate and connect with the systems and machines without the help of the programming language. The systems and softwares are only familiar with the machine codes. The machine codes are actually the particular arrangement of a series of the numbers. We might call the machine codes as bits. The languages of the higher level are only known by the humans, however, the languages of the higher level are not known by the machines. Machines and humans are not able to communicate and connect directly. As the humans are not able to understand and recognize the machine languages, thus, we require one intermediate. There are numerous programming languages, but following are some of the most important famous programming languages. Following are basically different kinds of programming languages. C is the general purpose programming language of the computer and this become developed and advanced between the years 1969 to 1973 by the Dennis Ritchie for the use of the Bell Telephone Laboratories by means of the Unix operating system. 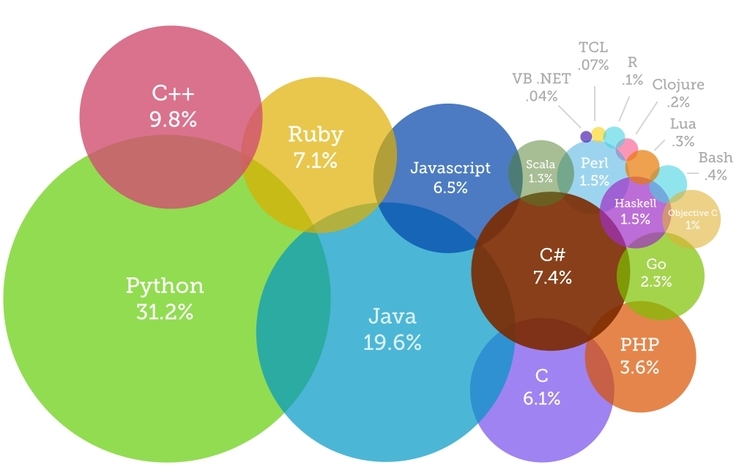 C is considered as the most famous programming language of all times. And there are very less architectures of computer for whom there is no compiler. 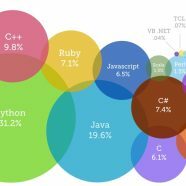 The majority of the other famous programming languages is influenced greatly by the C, most noticeably C ++ is the extension and expansion of the C. C is basically a procedural language means this is not an object oriented programming, It is actually a compiled language. C++ is an accumulated, compiled, general-purpose and object-oriented computer programming language. This language is viewed as a language of the intermediate level, as this language involves a blend of both low-level and high level features of the language. This language is the extension and expansion of the C language and it was developed in 1979 by Bjarne Stroustrup. C++ language is also among the most famous programming language. The application domains of C++ consist of the client applications, high-performance server, embedded software, device drivers, application software, system software, for instance, Microsoft Windows and entertainment software, for instance, video games. Proprietary and free C++ compiler softwares both are provided by the various groups. C# programming language is basically pronounced as “see sharp”. This is basically an object-oriented programming language. This is the part of the .NET family that is from Microsoft. C# 4.5.1 is actually the latest version, in addition, this is the part or the chunk of the Visual Studio 2013. C# programming language is expected to be a straightforward, modern, simple, object oriented and general purpose programming language. Anders Hejlsberg is the one who led its development team. This language is very much identical to Java and C++. Microsoft is the developer of C# and this programming language only works on the platform on the Windows. .NET (pronounced as “dot net”) is the framework on which C# is actually based. .NET is basically a computer software framework that primarily and mainly runs on the Microsoft Windows. In 2002, C# 1.0 and .NET Framework 1.0 introduced as a major aspect of the Visual Studio .NET 2002. Visual Studio is IDE the Integrated Development Environment and this is used while programming in the .NET platform as well as in C#. Objective-C is basically the object oriented, high level and a general purpose programming language and this language is founded on the programming language named as C. This language is the basic and the key programming language and this is utilized by the Apple especially for the iOS and OS X as well as by its respective and particular Cocoa Touch, Cocoa and API’s. A new programming language is released by the Apple named as Swift and this is the new and different proposed and suggested language for the OS X and iOS development. In the initial period of 1980’s, this programming language was originally created and this was chosen as the primary and the key language. This is utilized by the NeXT for its operating system named as NeXTSTEP and with the help of this iOS and OS X are determined and derived. Java is presently a standout amongst the most prevalent and famous programming languages being used, as well as is generally and extensively utilized right from the web applications to application software. The applications of the Java are normally compiled and assembled plus it keeps running on any of the JVM (Java Virtual Machine) irrespective of the computer architecture. Programming language Java is basically an object oriented and general purpose language. This is intended and proposed to allow the application designers “a chance to compose once, run at any place”. The Eclipse IDE is basically a common and a typical IDE for programming by means of Java. In order to make the Android applications, both Eclipse and Java is used. PHP is basically a server side and scripting language and this designed and planned for the development of the web yet additionally utilized as a general purpose computer programming language. In the HTML source document the code of PHP is actually embedded and set in and a web server is used in order to interpret this which actually creates the web page document. PHP is presently introduced and installed on over and above 244 million sites as well as on 2.1 million web servers, for instance, Facebook.com. On the majority of the web servers PHP might be installed and deployed plus as an independent and standalone interpreter. It is relatively free of cost on nearly each platform and operating system. Ruby was actually created thus the designers of it may have fun as well as be creative and productive in the meantime. Ruby is typically utilized for the development and advancement of back-end, and the famous websites, for instance, Slideshare, Hulu, Bloomberg, Shopify, Airbnb and many more, were altogether worked with the Ruby on the Rails.